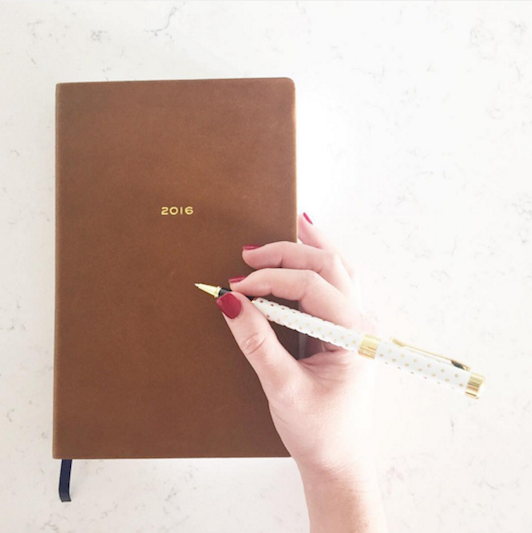 Have you made goals for 2016? Here are mine. Nothing too earth-shattering, just things I'd like to work on throughout this next year. Memorize Colossians 3 // I've learned that memorizing Scripture is really the best way for me to meditate on it throughout the day. I've memorized large passages before and have really enjoyed it, so this year I'm going to work on Colossians 3. Read 75 books // Last year on Goodreads I set a goal of 50 books, but I ended up reading 75. I decided to make that my goal again for this year. I absolutely love reading, and I typically spend some time reading every day. I think it will be attainable if I can stay on track. Learn to sew // I've always told my mom that she could teach me to sew once I had a baby. Well, I have a baby so it's time to learn! I don't ever plan on sewing my own clothes or being an expert seamstress; I would simply like to know how sew basic things. Send 50 notes // I'm a firm believer in snail mail. I'm only slightly obsessed with pretty notecards + stationery and love brightening someone's day with a piece of real mail. This number can include birthday cards but it cannot include thank you notes, as a written thank you note is a non-negotiable in my book. Last year I went over this number, so I'm hoping to be able to that again this year! Find a flattering lipstick // Setting super serious goals over here, folks. I've never had a lipstick that I love, so I'm determined to hunt for one this year. I imagine that this will include lots of trial and error. Run a race // Distance still undecided. My sister and I briefly talked about doing a race together. She's one month postpartum and I'm seven months postpartum, so we will see what we are up for. I just need something to keep me motivated! Learn to curl my hair // I have never been very good at styling my hair, but this year I would like to master an everyday, loose waves look. Kate, I'm looking at you for tutorials and tips! Cook more out of my cookbooks // Last fall I was cooking more of out of my cookbooks than I was magazines or Pinterest, and I loved it. I have some really quality cookbooks, and I don't like that they are sometimes forgotten on the shelf. Here's to discovering more delicious recipes from a source more reliable than Pinterest. I'd love to know what cookbooks you can recommend! I enjoy using them more than the internet, but I more often find recipes online. I cannot imagine reading 75 books in one year - and I enjoy reading too! I'm slow :) also yay for cookbook recipes and forgetting about Pinterest ones - I've found they are so unreliable! Thanks for sharing your goals - sorry I'm just reading! !